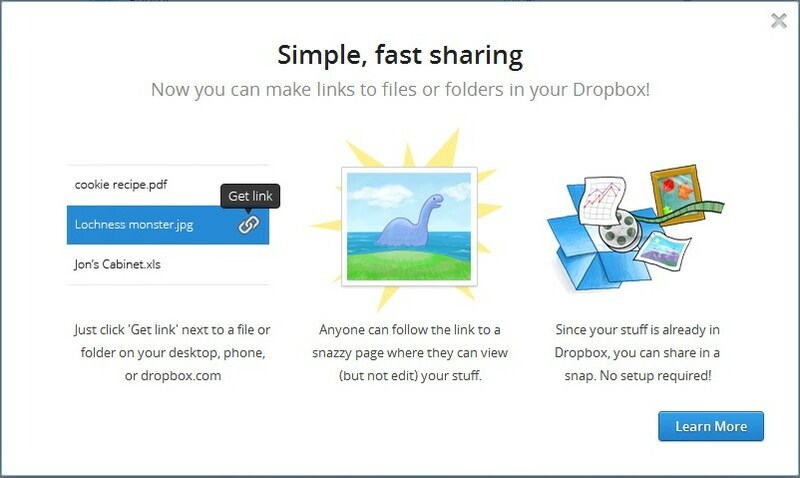 DropBox has launched a new feature, giving you the ability to create and share a link. This link can be created for all the stuff you have stored in the cloud. So if you have uploaded images of your vacation, Docs and presentations and videos that you have uploaded and stored in the cloud. Once you create a link you can then share it with friends and family and they can view it online in a web viewer by DropBox. The web viewer is quiet neat and aesthetically designed in full browser view for better viewing. Once you share a link with friends and family, they do not need an account to view the same. Whoever has the link can view your content in an open full browser. Since you content is already in the cloud there is no download required and people who you have shared the link with, can view your photos, docs and videos immediately. If you are a DropBox user and someone shares a link with you, you will be able to save that link in your folder. This is also being called DropBox instant sharing. You can share entire files, large files on the entire folder. From dropbox.com and on your computer, you need to select "Get link" for a file or folder in your Dropbox. On a mobile device, open the file and press the link icon in the bottom left corner. Once you click on 'Get Link To' a new browser window will pop-up with a link to that particular file in the URL bar. You will need to copy that URl in or web address from your browser window and share that link with friends.